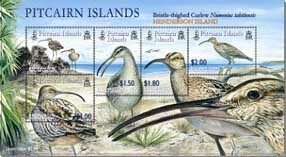 The Bristle-thighed Curlew Numenius tahitiensis as a species has been known to science since it was discovered in the South Pacific in 1769, but their breeding grounds were not discovered until the 1940s. Best described as a large, mostly brown shorebird with a down-curved bill, their colouring is tinged with buff, with blackish-brown appearing on the upper parts. The head is striped and legs and feet are a pale blue-grey. The bristle-like feathers at the base of the legs for which the bird is named, are often visible only in close up views. Growing to around 40cm in height, they are found in limited areas of western Alaska where they breed, and then winter over on a wide range of small islands in the South Pacific including the Hawaiian Islands, the Mariana Islands, Micronesia, Fiji, Samoa, French Polynesia and Henderson in the Pitcairn Islands group. Preferring quiet, undisturbed beaches and reef flats, they are quite aggressive in defence of their territory as they are when in their breeding grounds. During winter they moult which leaves them flightless and vulnerable to predators. Nesting on hilly, inland tundra ground sites they lay on average four eggs, which are incubated by both sexes for about 25 days. Chicks leave the nest shortly after hatching and are capable of feeding themselves, although they do receive parental care. Adults are very defensive of both eggs and chicks, and will perform distraction displays and outright attacks on potential predators. Following the breeding season, most Bristle-thighed Curlews congregate on the Yukon Delta, where they feed on berries, insects, and other food items in preparation for a non-stop, 2,500 mile journey to their South Pacific sites. Their normal diet is crustaceans, snails, small fish and the eggs of breeding seabirds. In order to crack the thick shells of large seabird eggs, the curlews sometimes employ rocks as tools, a rare occurrence in the bird world. Another rare and in fact unique occurrence is the moulting phenomena mentioned earlier. Listed as a species of high concern because of predators, and other threats including breeding ground vulnerability because of gold mining, the Bristle-thighed Curlew has an estimated population size of less than 10,000. Thankfully many of their migratory sites are now protected areas. 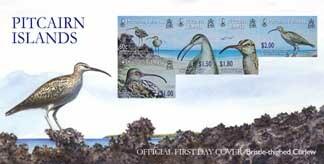 Although approximately only 1% of the species passes the non-breeding season in the Pitcairn Islands on Henderson, the island is considered a wintering site of international significance for this remarkable bird. Designer : Donna McKenna, Wellington, New Zealand. Perforation Gauge : 14.59 x 14.55 per 2 cms. Stamp Size : 37.13mm x 26.00mm 2 horizontal, 3 vertical. 14 September 2005, for a period of 2 years.